Deliciously hot soup to keep you warm through the cold months. Put the whole red peppers on a baking tray lined with tin foil. Roast in the oven for 25 minutes, then pop into a sealed ziplock bag to cool. Melt the butter in a heavy-bottomed saucepan set over a medium heat. Add the onions and cook for 3 to 4 minutes, until softened. Add the potatoes and cook for a further 10 minutes. Add the whole chilli and stock, bring to a simmer and continue to cook for 10 minutes, until the potatoes are soft. Take the roasted peppers out of the bag, gently peel off the skins and deseed. Add the red pepper flesh to the pot and cook for 4 minutes. Remove the chilli, then liquidise the soup with a stick blender until smooth. Mix the olive oil and turmeric together in a small bowl. 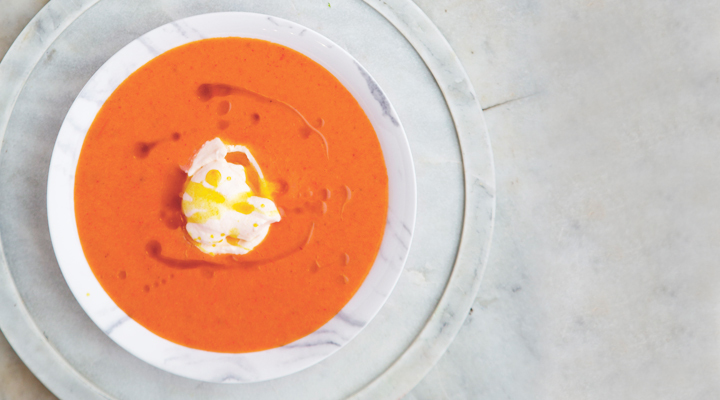 To serve, ladle the soup into bowls, add a spoonful of yogurt and drizzle with the turmeric oil.